← It’s a bird, it’s a plane, my god it’s a zucchini! For years now I have been a loyal customer. I’ve enjoyed nothing more than “getting in the game”. Each year I’ve looked forward to a new reincarnation of the NCAA Football series. With each new game I’ve waited patiently to see what new cool things you’d come up with. With the exception of the whole Erin Andrews thing (seriously did anyone but teenage boys enjoy that? It seemed as each time I got going in the game, she showed up. )- I’ve appreciated it all. My loyalty was tested last year with NCAA10. My issue? On the cover of the PS3 version was a player from Utah. As an Alabama fan, this was painful. I don’t know if you are aware but the Menstrual Bowl is a really, really embarrassing spot in an otherwise stellar two years of Crimson Tide football. It was an excruciating game to watch. So you can imagine how much it stung to see an Utah player highlighted there on the cover. But as horrible as that was… it pales in comparison to this year. Perhaps I missed something this last year. Did Florida actually win something? Did they win the SEC Championship? Did they win the NCAA Championship? Did a Florida player win the Heisman? Oh. Who did then? What? Alabama won the SEC Championship? Alabama won the NCAA Championship? Mark Ingram, an Alabama player… the FIRST EVER Alabama player won the Heisman? Then pray tell why Tim Tebow is on the cover. What did he do besides graduate? I thought I was done with having to see his ugly mug. So I must tell you- As much as it pains me, I will probably not buy NCAA11. I can not support this tom foolery. 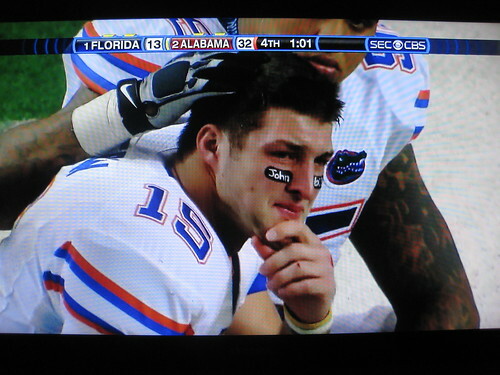 I will not subject myself to Tim Tebow each and every time I want to play a game. But you didn’t, so this is adieu. It’s been a good run. The one fan who probably has played more than one game as a mascot. This entry was posted in Uncategorized and tagged Alabama Crimson Tide, EA Sports, Football, Menstrual Bowl, NCAA11, Tim Tebow, Utah. Bookmark the permalink. Amen, sister, amen! Roll Tide Roll!